When I click the prompt in mobile phone it shows up a web page and it requests for my account information and after a successful login, I can access Internet. I want to know what is the name/type of protocol used for this authentication/authorization mechanism which lead to such a pop-up in browser? You can ignore below part but your answer would be welcome: Besides I want to know are there any software or configuration which can skip user name/password prompt and authenticate automatically under windows or android or there are no any? This technique is called a Captive Portal. When you connect to the WiFi network, the router (acting as a DHCP server) gives you an IP address. But that IP address gets marked as "unauthenticated" by the router. When an "unauthenticated" IP address makes a http or https request to an external website, that request gets intercepted. The router replies with a redirect to the login page. 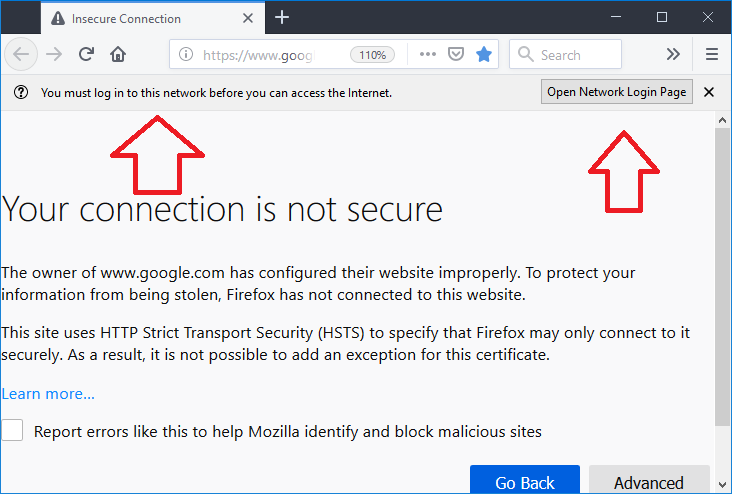 Depending on your browser's security settings, this might generate the "Your connection is not secure" error on HTTPS requests, because the reply doesn't come from the website it is supposed to come from. When you enter your login credentials, your IP address gets marked as "authenticated" and can now access websites normally. The "You must log in to the network" below the address bar is a special feature of Firefox called "Captive Portal Detection". It works by requesting the URL http://detectportal.firefox.com/success.txt and comparing the response with the expected one. If the browser receives a redirect or a login form instead, it assumes that the user is blocked by a captive portal. I don't know any, but if you use the same wifi regularly, then you could do it with a little shell script which uses wget to POST your login credentials directly to the captive portal URL. But you would need to write this specifically for each network, because the login URL and the POST fields will be different. Not the answer you're looking for? Browse other questions tagged authentication web-browser authorization internet or ask your own question. What is the opaque field in HTTP Digest Access Authentication used for? Secure touch kiosk system without updates? What is the proper flow for authentication?